As we write this, 200 prepared kits are lined up infront of us on our workshop table. We spent the last week individually preparing, testing and checking that each kit is packed and ready to go. It takes us about 20 mins to prepare each kit, and we made it to 200 before we hit the weekend. 14 hour days = 42 kits a day at best. We’re checking that the gaskets fit, inserting metal inserts so you can screw in the acrylic base plates and cleaning the case (literally – we are dusting down and brushing each transparent lens cover with toothpaste for a crystal clean finish). Even with all hands on deck, we still need to test and prepare the last 100 kits so we can only continue until the job is done and they are in the mail sack on their way to you. We’ll update you again early next week, but we wanted to let you know where we are in the process as we intended to ship this week – but in reality, it took us a little longer to physically prepare each kit than we had expected. 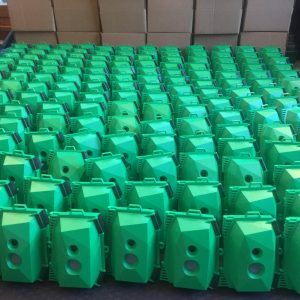 A 200 strong army of Wildlife Cam Kits after testing. ~100 to go. Impressive case. I would love to order a kit with just the case. Mounting the case hardware would be OK to do-it-yourself. Would a plain case be available sometime? Many thanks for your comments. We do plan to sell the case as a stand alone unit so you can source your own components in the near future. Right now we’re working to manufacture new kits and are updating a few of the features. If you want to know when they will become available the best place to get updates is via our newsletter. Signup on the homepage.